The meaning of life is a broad subject, touched in many films. Let’s slightly narrow the question down: is it important to consider other people’s interest when taking care of daily chores or making decisions for your own life? Will those choices affect what we pass to the next generation? Many might consider the film “Brad’s Status” written and directed by Mike White a boring film. Indeed, nothing fancy happens – no car crashes, epic fight scenes or expensive CGIs. And perhaps, the ratings on IMDB or Rotten Tomatoes do no justice to this film, since they fail to give the true picture of how wonderfully heart-warming and educational this film is. 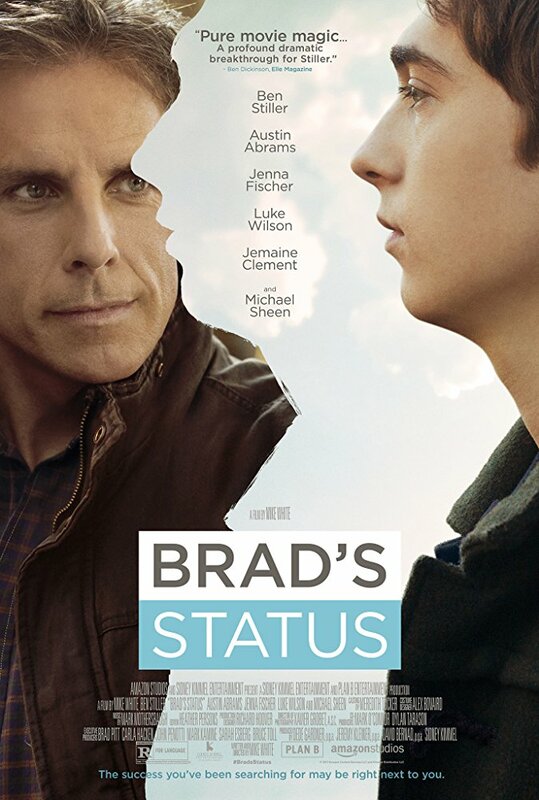 In “Brad’s Status”, a father takes his son to a tour to visit colleges and decide where he wants to apply. For the father – Brad (Ben Stiller) this is a tour to his past, where he will meet his old friends and try to assess his achievements and competence. Bran thinks he has not achieved any success in his life -unlike his friends, who have money, fame, personal airplanes and much more. Meanwhile, his son Troy (Austin Abrams) turns to be the living reminder of his biggest achievement. After all, he has raised a talented boy who he will never be ashamed of. Brad ‘s characters is a very interesting one. He is charismatic and kind but also has his flaws – he is very insecure. He never cheats to earn an extra dollar. Even for this tour to East Coast he has to use his discount coupon but is unable to upgrade the economy class tickets to business class. He is trying to help Troy to get accepted to Harvard as he knows his son is a promising musician. But not everything will run smoothly on this journey and through interaction with each other, both of them will rediscover each other and their own selves. Craig Fisher (Michael Sheen), Billy Wearslter (Jermaine Clement) and Jason Hatfield (Luke Wilson) used to be Brad’s friends. Now, all of them are rich and successful – something Brad always wanted for himself and his family. In his mind, Brad is constantly analyzing his life, asking himself questions, coming up with various scenarios regarding why things went the way they did for him. And these questions are what prevents him from maturing up mentally and psychologically. It will take time for him to realize his true happiness has always been around, while the long-lost friends’ success is not a good measurement for one’s own happiness. In conclusion, I am not sure of the reason why “Brad’s Status” gets so much negative feedback. That’s why I felt I needed to give Mike White’s film a shot. My great surprise was not completely unexpected since I genuinely believe in Ben Stiller’s talent in finding meaningful stories. I was deeply moved by the entire film as well as its harmless, family-oriented atmosphere. It deals with values of past and present; negativities that one should let go of; it also questions whether long-gone friendships are or are not worth to be resurrected. But most importantly, this film is about the status of a man who is struggling to improve his life and who finally realizes it is nobody’s but his son’s recognition that matters to him the most.